Take a break from prints with these simple, stylish swim shorts from ami. Perfect for packing away or daily trips to the gym, they're finished with internal mesh lining and side pockets. Feel uncomfortable in a pair of speedos? We’ve got your men’s board shorts needs sorted! 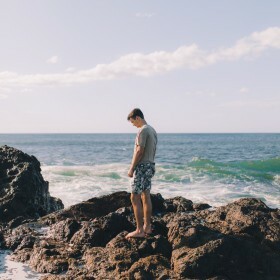 In summer, your swimwear becomes your everyday wear - it’s just too hot to change into something else - so you need a pair of boardshorts that sits perfectly. There are a billion different variations so it’s easy to find a pair that fits your personality best! Whether you’re up for a crazy colour (think neon red, orange or yellow), love yourself a funny print or prefer a basic colour like black or navy blue - there’s a massive selection of men’s board shorts just waiting for you to scroll through!